A beautifully illustrated Torah in the style of illuminated Jewish manuscripts of old. 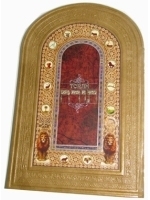 The Matan Arts Illuminated Torah Includes the complete Chumash - the 5 Books of Moses in English (JPS translation) and vowelized Hebrew in columns on the same page. The embossed leatherette cover is accented with gold leaf. Printed in Israel.